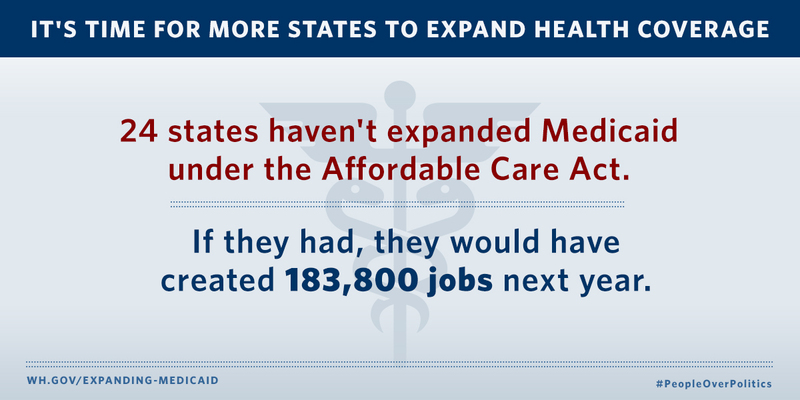 22 states have yet to expand Medicaid coverage under the Affordable Care Act. If they don't change course, 5.1 million people will go without health insurance in 2016. 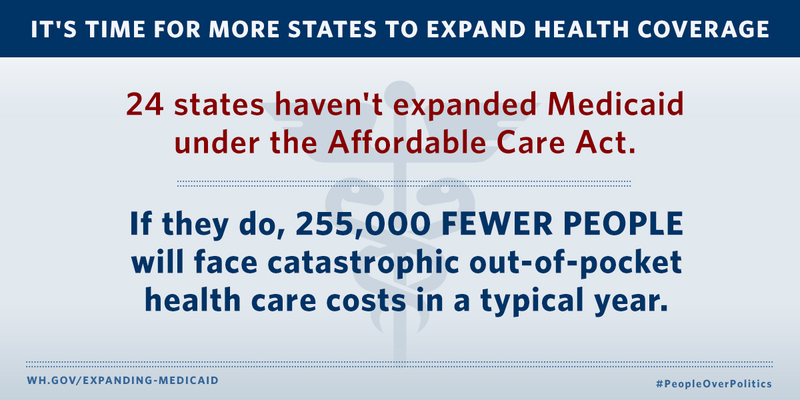 The Affordable Care Act has expanded high-quality, affordable health insurance coverage to millions of Americans. One way it’s expanding coverage is by offering financial support to states that opt to expand Medicaid eligibility to all non-elderly individuals in families with incomes below 133 percent of the poverty line. Twenty-eight states and the District of Columbia have seized this opportunity — and as a result, 8.6 million people have gained Medicaid or Children’s Health Insurance Program (CHIP) coverage since the beginning of the Affordable Care Act’s first open enrollment period. This number will only grow in the months and years ahead as Medicaid enrollment continues. 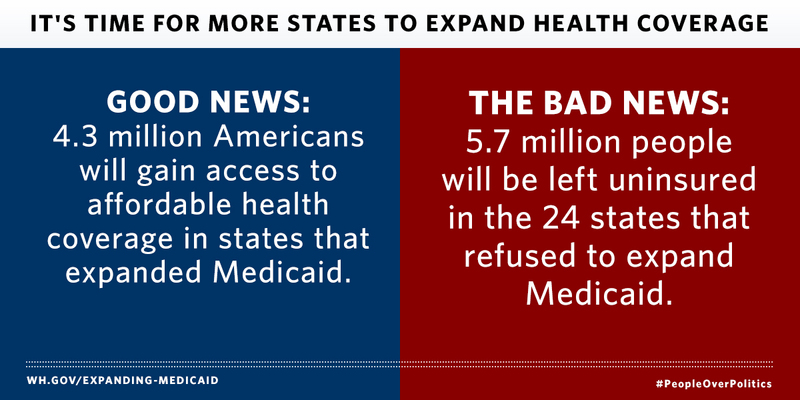 But 22 states have not yet expanded Medicaid — including many of the states that would benefit most. If they don't opt to expand Medicaid, 5.1 million people will be without health insurance coverage in 2016, and these states will forgo billions in federal dollars that could boost their economies. 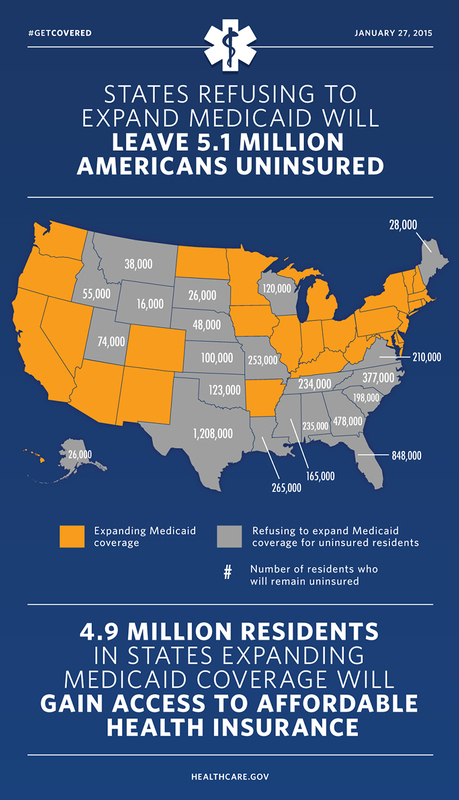 Learn more below about the impacts of Medicaid expansion, and read the full report on the consequences of states' decisions not to expand Medicaid. The map below shows how Medicaid expansion will help more people in each state across a number of indicators — including access to affordable health insurance, new jobs created, and preventive care. This resource has expired and been removed. Select the image to see it full size. The Faces of Health Care: Carol W.